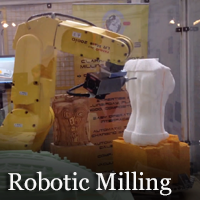 We work with a company called IRBCAM in Norway that provides a solution to convert G-code generated from any of MecSoft’s products to robot language code. IRBCAM is a standalone product that converts NC-code (G-code or APT-CLS format) to executable robot motion code. It takes as input a NC code file and the user has the ability to select a robot of choice from a built in library of over 250 commercially available robots and convert the NC code to the robot motion code that the selected robot can execute. The robot cell can be modeled and collision detection can also be performed to make sure the output code is collision free. How does IRBCAM work with MecSoft’s products? Users of our products (VisualCAD/CAM, RhinoCAM & VisualCAM for SOLIDWORKS) can program 3, 4 or 5 axis toolpaths and output the program using the built in APT CLS post-processor. This APT-CLS program can then be loaded in IRBCAM to create the robot language commands. Our products can also be setup to automatically bring up IRBCAM when post-processing is performed.